This post is completely unrelated to anything going on in my life right now ... other than that someone I know mentioned something that sent me off on an interesting search. 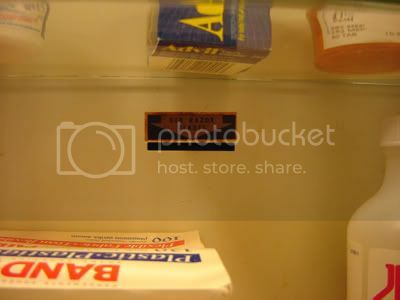 Coworker and buddy Jason White told me about a slot in the back of his medicine cabinet labelled "Old Razor Blades" (fixed broken link) -- but with no apparent site to recover the old blades. He figures they just go into a cavity in the wall. To boast about Christmas gifts is decidedly un-Canadian, but I want to extend my thanks to everyone this holiday season for their generous and thoughtful giving by hitting just a few of the highlights. From my parents, a Roomba robot vacuum cleaner. I love vacuuming, but I also love robots, so to have a robot that will chase the kitties around during the day and clean up hair and crumbs will be really, really cool. From Sandra and Byron, a donation-in-name-of to an organization that buys goats for the goatless and hungry -- what a neat idea! And a Buddha Board -- a nifty thing that encourages you to just blurt out your visual creativity on a page by painting with water in a medium that shows up for a while, then fades away. We saw these in Charlottetown last year, and I thought they were way, way cool. Thank you. Stacks of Christmas joy, originally uploaded by BigAssSuperBlog. I thought we were going to "tone it down" this year. All these presents are dwarfing the tree. TV karma will burn me harshly for this one day, but for now, I'm chortling. At the end of the video, the pretend YouTube offers a link to a video with 63-million hits called "Kitten smokes on toilet". After I watched the show, I checked YouTube and there was no video called "Kitten smokes on toilet". Of course, I felt obliged to provide one. See below. Note there is no toilet, no smoking, and the kitten is Amanda's Kitty. Yeah, it's cheap, but someone was going to do it. Why not me? UPDATE: After drawing 26-hundred hits with the "Kitten smokes on toilet" label -- and 30-some comments from YouTubers pissed off about my sneakery, I've put the video label back to something a little more honest. Hey, look. It's my teeth. Spooooky, mang. That's the third panoramic x-ray I had done during a visit to one of Halifax's top orthodontists for a consultation on getting a billion-dollar smile. The panoramic x-ray machine had a hard time navigating around my broad, manly, hulking shoulders. That, and I was biting the bite-thingy wrong the first time and moved a little. Apparently I have a borderline skeletal Class III malocclusion. Moderate overbite, 2mm overjet, deep Curve of Spee, maxillary anterior diastema, excessive upper and lower interdental spacing, incisal misguidance, mandibular retropositioning, mandibular thrusting, anterior bruxing, abraded 1-2, 1-1, 2-1, 2-2, 3-2, 3-1, 4-1, 4-2, mandibular left closing shift, temporomandibular joint dysfunction, mandibular macrognathia, dental asymmetry, missing 1-8, 2-8, 3-8, 4-8, malformed (small) 1-2, 1-1, 2-1, 2-2, 3-2, 3-1, 4-1, 4-2. I've tossed some old commercials up on to the YouTube. Jason White just blew my mind by telling me the Channel 7 Eyewitness News theme I grew up with -- WKBW in Buffalo -- had words. He didn't sing them. He posted The Hilltop Singers, "Move Closer To Your World". But the music doesn't work. So here it is in MP3 (nope). Jason says this TV station tribute page also has it. It reminds me that some time ago, I asked the folks over at the Big Yellow Board, SOWNY, if anyone knew the name of the song they used to use on Toronto's CityTV for the CityPulse News Test. Turns out it's a Warren Zevon song called Nighttime In The Switching Yard. Here's a video at ArtistDirect. Mind blown again. I put some food down for Amanda's Kitty, and a few nuggets bounced away. One went under this piece of furniture. Kitty went under the furniture to get it. There, she stayed.We put the plate of food nearby to see if she'd do a variation of one of her typical eating routines -- lying down, reaching out lazily, grabbing a nugget off the plate, and happily crunching it with minimal effort.She did. Lazy kitty.